You’ve probably noticed that The House of Scamp favors a certain Scandinavian home furnishings store. Well, we’re remodeling our kitchen, and guess where the new cabinets are coming from? 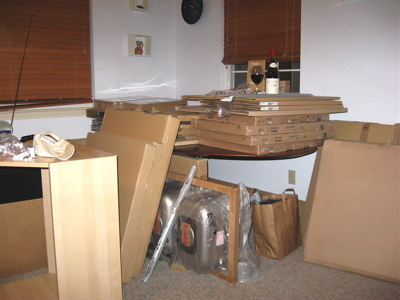 That’s right, I have 800 boxes of kitchen piled up in my living/dining room, and for the next 2-3 weeks I’ll be assembling, installing, and then playing with tile as well. So I’m very glad that this month’s Wine Blogging Wednesday theme was chosen by Joel at Wine Life Today to be “comfort wine,” because I could really use some right now. Tearing up my kitchen is starting to have a rather profound effect on my psyche; something about chaos affecting the hearth makes my house feel less like a home and more like a take-out dumpster. And I have my comfort wine to keep me warm in the meantime. 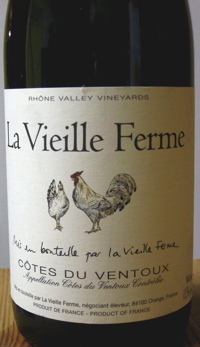 It’s not fancy by any means, and I mean that: La Vieille Ferme Rouge is a mere Cotes du Ventoux, a blend of Grenache, Syrah, Cinsault and Carignan. It’s a friendly little table wine from the Perrin family, the makers of the iconic Beaucastel Chateauneuf-de-Pape, and I discovered it when I was in the wine business. As you can see from the label, it’s not much of an eye-catcher on the shelf, and thus it’s a well-kept secret. I’ve been drinking it for years; some vintages it’s a little lighter and sillier, some vintages it’s more intense and rich. Dark, deep red in the glass. Nose of grape must and raspberry juice, as well as dusty earth and a hint of white pepper. Pretty structured this vintage, with brusque tannins, dark earth, cranberry and blackberry on the palate. Really, this wine would go better with barbecue or kielbasa than the turkey and dressing I frequently pair it with (it’s been a go-to Thanksgiving wine for many years now). Also, it’s less of a quaffing wine this vintage; however, it sells for about $6.99, tastes damn delicious, and really takes the edge off of a slight mis-calculation in kitchen dimensions and the subsequent gnashing of teeth. Thanks to Lenn at Lenndevours for inventing Wine Blogging Wednesday, the wine blogosphere’s most enduring meme, and to Joel at Wine Life Today, for reminding us that wine can soothe just as much as it can excite. Lucky you on the new kitchen! Someday in my house….! Sounds like a great wine. As far as appliances go, I have far more than I should admit to…but a toaster, toaster oven, coffee maker, eletric knife, can opener, wine fridge, kitchen aid mixer, waffler maker, food processor, blender, microwave…I think there are more, but that’s what I can think of off the top of my head! At least you don’t have three rice cookers. /How the hell did I get three rice cookers? Hmmm. I got a coffee maker, blender, food processor, crock pot and toaster oven out right now. Under the cabs lie a waffle maker, coffee grinder, and ice cream maker (which will take the crock pot’s place when the heat gets unbearable). I don’t even have a bread machine-and I’d like one if there were room- or a juicer. So no, seven is not a lot!